New York — The leading U.S. metropolitan areas for commercial and multifamily construction starts registered a varied performance during 2018 compared to the previous year, according to Dodge Data & Analytics. Of the top 10 markets, ranked by the dollar amount of construction starts, four reported greater activity in 2018 while six showed declines. For the metropolitan areas ranked 11 through 20, seven reported gains while three reported declines. At the national level, the volume of commercial and multifamily construction starts in 2018 was $212.4 billion, up 4%, which represented a moderate rebound after a 3% setback in 2017. The New York NY metropolitan area, at $28.7 billion in 2018, continued to be the leading market in the U.S. for commercial and multifamily construction starts, advancing 10% after its 13% drop in 2017. New York NY’s share of the U.S. total was 14% in 2018, up from 13% in 2017, although not as high as its peak 19% share reported in 2015. The next three markets in the 2018 top 10 all showed gains relative to 2017 – Washington DC ($9.5 billion), up 28%; Boston MA ($9.2 billion), up 72%; and Miami FL ($8.2 billion), up 19%. The remaining six markets in the top 10 with their declines relative to 2017 were – Los Angeles CA ($7.0 billion), down 11%; Dallas-Ft. Worth TX ($6.9 billion), down 16%; Chicago IL ($6.7 billion), down 1%; San Francisco CA ($6.0 billion), down 18%; Atlanta GA ($5.7 billion), down 14%; and Seattle WA ($5.7 billion), down 14%. For the metropolitan areas ranked 11 through 20, the seven showing greater activity in 2018 relative to 2017 were Houston TX ($4.5 billion), up 9%; Austin TX ($4.0 billion), up 22%; San Diego CA ($3.1 billion), up 12%; Minneapolis-St. Paul MN ($3.0 billion), up 16%; Phoenix AZ ($2.8 billion), up 5%; Kansas City MO-KS ($2.8 billion), up 46%; and Sacramento CA ($2.3 billion), up 44%. The three metropolitan areas in this group with decreased dollar amounts of commercial and multifamily starts in 2018 were Philadelphia PA ($4.0 billion), down 6%; Denver CO ($2.8 billion), down 23%; and Orlando FL ($2.6 billion), down 19%. The commercial and multifamily total is comprised of office buildings, stores, hotels, warehouses, commercial garages, and multifamily housing. Not included in this ranking are institutional building projects (e.g., educational facilities, hospitals, convention centers, casinos, transportation terminals), manufacturing buildings, single family housing, public works, and electric utilities/gas plants. The 4% increase for commercial and multifamily construction starts at the U.S. level in 2018 reflected greater activity for multifamily housing, up 8% to $95.1 billion, and the commercial building categories as a group, up 1% to $117.3 billion. Multifamily housing in 2017 had fallen 8% after appearing to have reached a peak in 2016, before posting the 8% rebound in 2018. After surging 23% in 2016, commercial building starts have shown slight improvement, edging up 1% in both 2017 and 2018. “The brisk expansion for the U.S. economy during 2018 enabled market fundamentals for commercial building and multifamily housing to strengthen, after having shown some erosion during the previous year,” stated Robert A. Murray, chief economist for Dodge Data & Analytics. 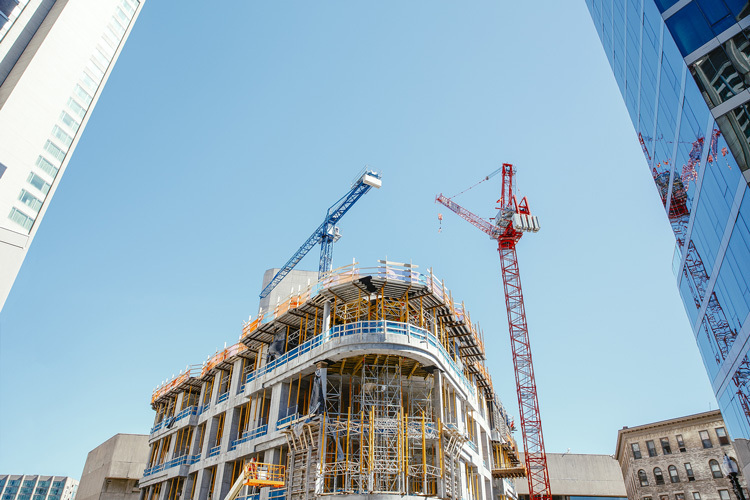 “This provided the backdrop for the healthy volume of commercial and multifamily construction starts that took place during 2018. A further boost came as a number of very large projects reached groundbreaking last year. For office buildings, this included such projects as the $1.8 billion Spiral office building in the Hudson Yards district of New York NY, a $665 million office building on North Wacker Drive in Chicago IL, and the $644 million office portion of the $1.3 billion Winthrop Square Tower in Boston MA. Large data center project starts, which are included in the office category, were also very strong in 2018, with the Washington DC area seeing the start of eleven such projects valued at a combined $1.6 billion. Hotel construction starts in 2018 were led by such projects as the $643 million hotel portion of the $1.5 billion Manchester Pacific Gateway mixed-use complex in San Diego CA and the $450 million Omni Seaport Hotel in Boston MA. The rebound for multifamily housing in 2018 was supported by such projects as the $700 million City View Tower at Court Square and the $600 million 85 Jay Street high-rise, both in the New York NY metropolitan area, as well as the $580 million multifamily portion of Boston’s Winthrop Square Tower and the $429 million multifamily portion of Seattle’s 1200 Stewart Street mixed-use high-rise. The New York NY metropolitan area in 2018 registered a 10% gain for commercial and multifamily construction starts to $28.7 billion, bouncing back after a 13% drop in 2017. Most of the upward push came from the commercial project types, which climbed 22% after sliding 27% in 2017. Office construction starts advanced 22% in 2018, led by groundbreaking for the $1.8 billion Spiral office building and the $480 million addition to the Hudson Commons office building, both in the Hudson Yards district of Manhattan. Other noteworthy office starts were the $250 million gut rehabilitation of the former Domino Sugar Factory and the $233 million office portion of the $300 million One Willoughby Square mixed-use development, both in Brooklyn. New hotel construction starts were particularly strong in 2018, jumping 118% with the lift coming from the $300 million Tribeach Holdings Hotel in Manhattan and the $218 million hotel portion of the $400 million Resorts World Casino and Hotel expansion in South Ozone Park. Store construction starts improved 4% in 2018, reflecting groundbreaking for a $70 million shopping center in Staten Island, while new warehouse construction starts retreated 27%. Multifamily housing in the New York NY metropolitan area edged up 2% in 2018 following a 1% gain in 2017, as construction starts have shown slight growth since the 27% correction that was reported back in 2016. Leading the way for multifamily housing in 2018 was the $700 million City View Tower at Court Square and the $550 million Queens Plaza Park Apartments in the Long Island City section of Queens, the $600 million 85 Jay Street and the $375 million Hoyt Street high-rises in Brooklyn, and the $250 million Journal Squared 2 high-rise in Jersey City NJ. During 2018, there were 24 multifamily projects valued at $100 million or more that reached groundbreaking, the same as the 24 such projects that reached groundbreaking in 2017.